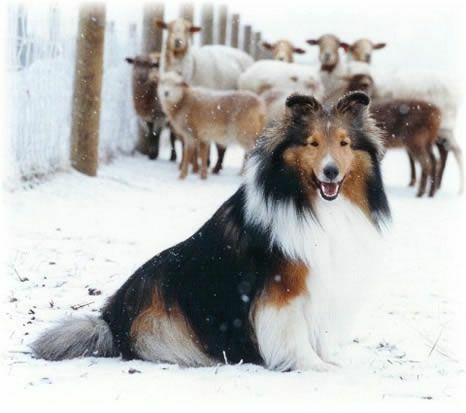 Learn to be the sheepdog, and get proactive about security monitoring with this great, open-source tool. Read on to learn how to use it! We live in a world of asymmetrical battles, often conflicts that aren't always obvious in purpose and intent, and likely fought on multiple fronts. For one of the best reads on the topic, take the well spent time to read TJ O'Connor's The Jester Dynamic: A Lesson in Asymmetric Unmanaged Cyber Warfare. If you're reading this post, it's highly likely that your front is that of 1s and 0s, either as a blue team defender or as a red team attacker. I live in this world every day of my life as a blue teamer at Microsoft, and as a joint forces cyber network operator. We are faced, each day, with overwhelming, excessive amounts of data, of varying quality, where the answers to questions are likely hidden, but available to those who can dig deep enough. New platforms continue to emerge to help us in this cause. At Microsoft, we have a variety of platforms that make the process easier for us, but no less arduous, to dig through the data, and the commercial sector continues to expand its offerings. For those with limited budgets and resources, but a strong drive for discovery, there are outstanding offerings as well. Security Onion has been at the forefront for years and is under constant development and improvement in the care of Doug Burks. Another emerging platform, to be discussed here, SOF-ELK, is part of the SANS Forensics community, created by SANS FOR572, Advanced Network Forensics and Analysis author and instructor Phil Hagen. Count SOF-ELK in the NFAT family for sure, a strong player in the Network Forensic Analysis Tool category. SOF-ELK has a great README, don't be that person, read it. It's everything you need to get started, in one place. What!? SOF-ELK offers some good test data to get you started with right out of the gate, in /home/elk_user/exercise_source_logs, including Syslog from a firewall, router, converted Windows events, a Squid proxy, and a server named muse. You can drop these on your SOF-ELK server in the /logstash/syslog/ingestion point for syslog-formatted data. Additionally, utilize /logstash/nfarch/ for archived NetFlow output, /logstash/httpd/ for Apache logs, /logstash/passivedns/ for logs from the passivedns utility, /logstash/plaso/ for log2timeline, and /logstash/bro/ for, yeah, you guessed it. Run down a few data rabbit holes with me, I swear I can linger for hours on end once I latch on to something to chase. We'll begin with a couple of highlights from my Apache logs. 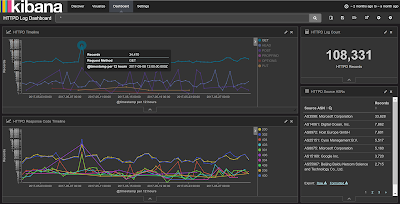 The SOF-ELK VM comes with three pre-configured dashboards including Syslog, NetFlow, and HTTPD. 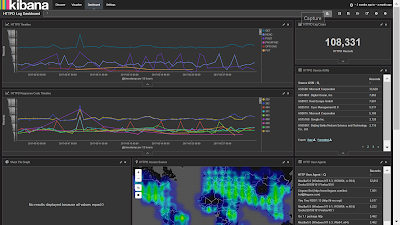 You can learn more on the start page for the SOF-ELK UI, my instance is http://192.168.50.110:5601/app/kibana. There are three panels, or blocks, for each dashboard's details, at the bottom of the UI. I drilled through to the HTTPD Log Dashboard for this experiment, and immediately reset the time period for analysis (click the time marker in the upper right-hand part of the UI). It defaults to the last 15 minutes, if you're reviewing older data it won't show until you adjust to match your time stamps. My data is from the month of May so I selected an absolute window from the beginning of May to its end. You can also select quick or relative time options, it's great to get comfortable here quickly and early. The resulting opening visualizations for me made me very happy, as seen in Figure 1. The beauty of these SOF-ELK dashboards is that they're immediately interactive and allow you to drill right into interesting data points. The holisticinfosec.org website is intentionally flat and includes no active PHP or dynamic content. As a result, my favorite response code as a web application security tester, the 500 error, is notably missing. But, in both the timeline graphs we note a big traffic spike on 8 MAY 2017, which correlates nicely with my above-mentioned scan from work, as noted in the ASN hit count, and seen here in Figure 2. The PUT request from each included a .txt file attempt, specifically dbhvf99151.txt and htjfx99555.txt, both were rejected, redirected (302), and sent to my landing page (200). That's a groovy little hunting trip through HTTPD logs, but how about a bit of Syslog? I spotted a likely oddity that could be correlated across a number of the exercise logs, we'll see if the correlation is real. You'll notice tabs at the top of your SOF-ELK UI; we'll use Discover for this experiment. I started from the Syslog Dashboard with my time range set broadly in the last two months. 7606 records presented themselves, sliced neatly by hosts and programs, as seen in Figure 5. Squid proxy logs showed the predominance of host entries (6778 or 57.95% of 11,696 to be specific), so I started there. Don't laugh, but I'll often do keyword queries just to see what comes up, sometimes you land a pointer to a good rabbit hole. Within the body of 6778 proxy events, I searched malware. Two hits came back for a GET request via a JS redirector to bleepingcomputer.com for your basic how-to based on "random websites opening in Chrome." Ruh-roh. Do I need to build this user profile out for you, or are you with me? Proxy logs tell us so much and are deeply worthy of your blue team efforts to collect and review. I jumped over to the named_log from the muse host to see what else might reveal itself. Here's where I jumped to Discover, the Splunk-like query functionality inherent to SOF-ELK (and ELK implementations). I did a reductive query to see what other oddities might surface: 10.3.59.53 AND dns_query: (*.co.uk OR *.de OR *.eu OR *.info OR *.cc OR *.online OR *.website). I used these TLDs based on the premise that bots using Domain Generation Algorithms (DGA) will often use the TLDs. See The DGA of PadCrypt to learn more, as well as ISC Diary handler John Bambanek's OSINT logic. The query results were quite satisfying, 29 hits, including a number of clearly randomly generated domains. Those that were most interesting all included the .cc TLD, so I zoomed in further. Down to five hits with 10.3.59.53 AND dns_query: *.cc. Oh man, not good. I had a hunch now and went back to the proxy logs with 10.3.59.53 AND squid_request:*.exe. And there you have it, ladies and gentlemen, hunch rewarded. If taxdocs.exe isn't malware, I'm a monkey's uncle. Unfortunately, I could find no online references to these .cc domains or the .exe sample or URL, but you get the point. Given that it's exercise data, Phil may have generated it to entice you to dig deeper. When we think about the IOC patterns for Petya, a hunt like this is pretty revealing. Petya's "initial infection appears to involve a software supply-chain threat involving the Ukrainian company M.E.Doc, which develops tax accounting software, MEDoc." This is not Petya (as far as I know) specifically but we see pattern similarities for sure, one can learn a great deal about the sheep and the wolves. Be the sheepdog! There are few tools better in the free and open-source arsenal to help you train and enhance your inner digital sheepdog than SOF-ELK. "I'm a sheepdog. I live to protect the flock and confront the wolf." ~ LTC Dave Grossman, from On Combat.